Jodie Berndt shows you how to make the Bible a book of prayers that can powerfully influence your children's lives. You'll discover how to pray specifically and expectantly for their faith, character, safety, relationships, and future. You'll gain new, biblical perspectives on God's purposes for your children. And through the encouragement of the Scriptures and true-life stories, you'll find out what a huge difference your prayers really make in the lives of those you love most. Discover How to Pray God's Will for Your Children's Lives There's no place like God's Word to turn to when you want to pray confidently and effectively for your kids. ?Prayers permeated with the Word of God bring about changes in our children and keep us in touch with God's priorities. This is a wonderful resource that you will want to refer to over and over.? Fern Nichols, founder and president of Moms in Touch International ?If I could choose only one book to help me pray for my children, this is it! Not only has Jodie given us a rich treasure of true stories, practical prayers, and relevant Scriptures for our children, but a surprise awaits! In reading this I found my own confidence if God growing. RUN and get this book for moms and grandmoms.? Susan Alexander Yates, author of How to Like the Ones You Love ?I know of no one who can speak more authoritatively than Jodie Berndt on praying for your children. Every parent who wants their children to grow into godly men and women should read this book. 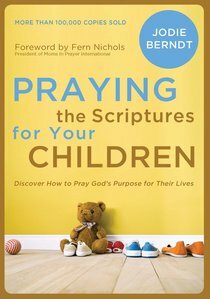 About "Praying the Scriptures For Your Children"
Jodie Berndt is the author of several books, including Celebration of Miracles, Praying the Scriptures for Your Children and Praying the Scriptures for your Teenagers. A frequent speaker at conferences, retreats, and church events, Berndt's passion is for raising and equipping kids and teenagers to love and serve the Lord. Berndt graduated from the University of Virginia with a BA in English in 1984. She and Robert live in Virginia Beach, Virginia, with their children Hillary, Annesley, Virginia, and Robbie. Customer Reviews For "Praying the Scriptures For Your Children"
As a busy mum of three children under the age of six, I don't get a lot of free time. But I keep this book handy in the living area, so when I have a few extra minutes in my day, I pull it out and read a chapter and pray for my children. Today I prayed for them to have self-control and self-discipline. Each chapter takes less than 10 minutes to read and it ends with Bible verses that you can use as prayer prompts. The book is divided into different parts. Praying for your child's 1. fath, 2. character, 3. safety, 4. relationships, 5. future. This would be a great book to give to parents or carers, or to use yourself.